Finding an unmarked queen is difficult enough so getting her marked early in the season is vital for what comes later. 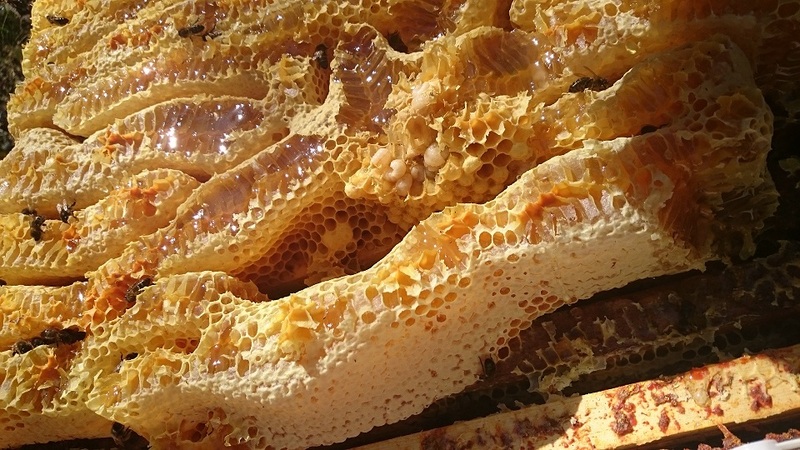 As an illustration of that – see if you can spot the queen in the photo above – experienced beekeepers hold your whist! If you use Apiguard – be sure not to leave the eke on over winter or if you do, make sure get back to it before the dandelions do! Perhaps this is why we call it an eke – we just spell it wrong; it should be eek. But note the rich yellow colour of dandelion honey – click the photos for a better look. Ted Hooper’s five questions – as described in his book ‘Guide to Bees and Honey’ were devised to walk the beekeeper through his or her weekly inspections. The first 5 columns in the Colony Assessment Sheet are there for you record the answers. Take a look at this frame of bees above – yes there are several things there that should put you on alert! There are all sorts of bees for sale out there – Buckfast, Carniolan, Italian, Russian, Greek – you name it but how can they possibly be better than the locals on their home turf? Think about it, think about the risks in importing diseases and god knows what-all else. Don’t import bees – improve your own. Click here for more information on the Native Irish Bee. Here’s how and it isn’t difficult. In fact it’s fun and very rewarding – you will see real results year on year. We used to have some really horrible bees here and only a few hives of them but each year they would chase us round the garden. Now, in the middle of summer I have around 25 hives of bees here and stings are rare. Bee improvement is not difficult – anybody can do it and in fact every beekeeper should do it. The first step is to assess your colonies for a full season and record the data in a Colony Assessment Sheet. It will take a full season because the bees often do not show their true colours till they are big and strong and start to throw their weight about. Once you have the data you can compare colonies systematically and objectively then select stocks for breeding and stocks for culling. The sheet below has been designed to record both Colony Assessment Data and routine beekeeping information from each visit. Click it for a better view. Swarming is what bees do – if they are healthy they will swarm, so take that on board and you won’t be disappointed. 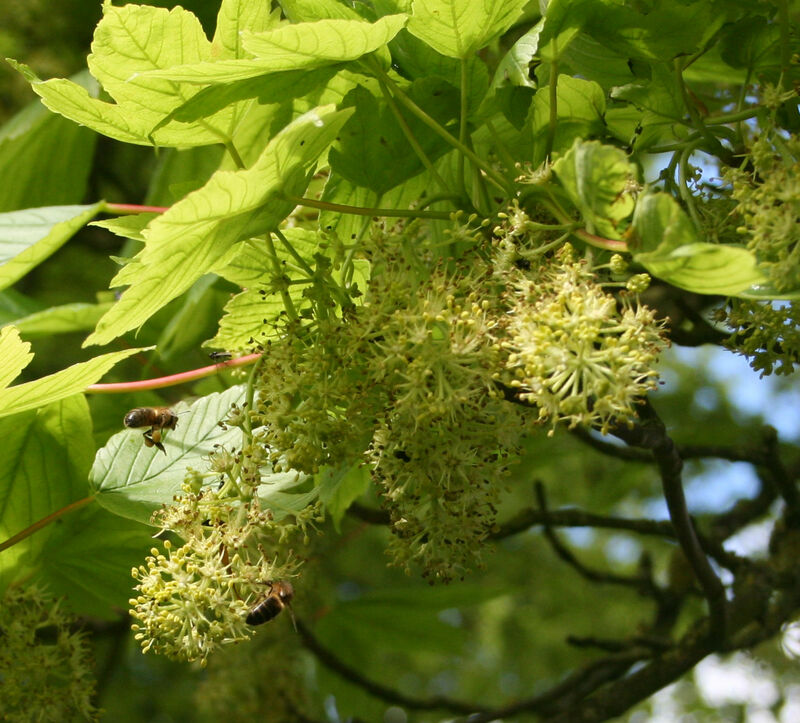 Between the showers, the sun is very strong and the the sycamores are alive with bees. 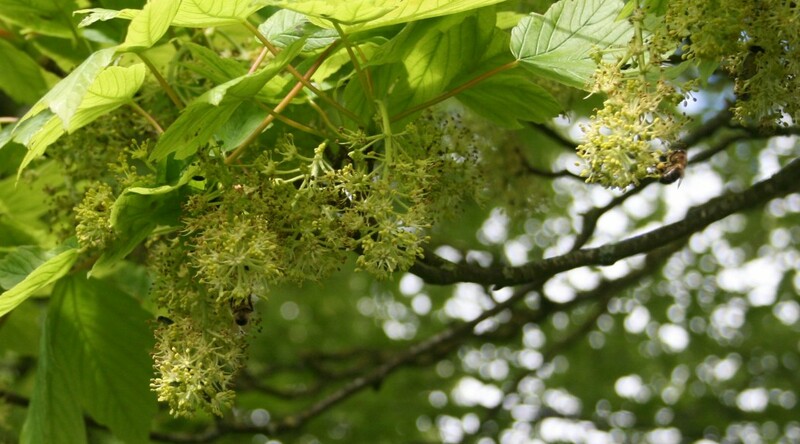 One of the good things about sycamore flowers is that they hang down beneath the leaves in the shelter of the canopy so showers don’t really harm them. However, gusty squalls will tear off the flowering panicles – lovely. The forecast for the next few days is good, so with the trees in full bloom there is a good chance of a few pounds of honey. If you click on this picture you should be able to see a close up of the snot green pollen loads.